Serving Southern California for over 80 years with exceptional on time service and outstanding quality. From one small carton to a truck load, HDS can handle your shipping needs in Southern California. Let us show you what our commitment to Customer Service, Dependability, and Quality can do for you and your customers. 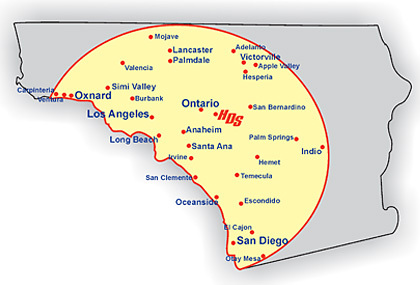 Our 86 door cross dock facility located in the Inland Empire allows HDS to efficiently serve the entire Southland with next day deliveries from one location, also reducing the re-handling of your product. On time, complete and damage free deliveries is the commitment from HDS to every customer. Let HDS be the solution to your shipping needs. Call us today for a quote, or to schedule a pick up. ©2009 HDS, Inc. All rights reserved.